On daily life: I want more than this! It’s so BORING here. On fathers: I knew I got this from somewhere! On vacations: It needs to be a very long time, preferably on another planet with no distractions, and I should leave transformed. On cat-like reflexes in high-stakes moments: I got this, just cover me. This Star Wars approach to my disability is an extension of my attitude on life in general: everything has two sides. I can usually follow the breadcrumb trails from a terrible moment in my life to something wonderful. The trick is to be okay with looking at the dark side, without drowning in a shame wave. It takes time to be able to do this without feeling like crap. To be able to say, “Yes, I do that sometimes.” and not want to give yourself a thousand lashes. I believe this true for humans in general, not just those of us with high-maintenance neurotransmitters. 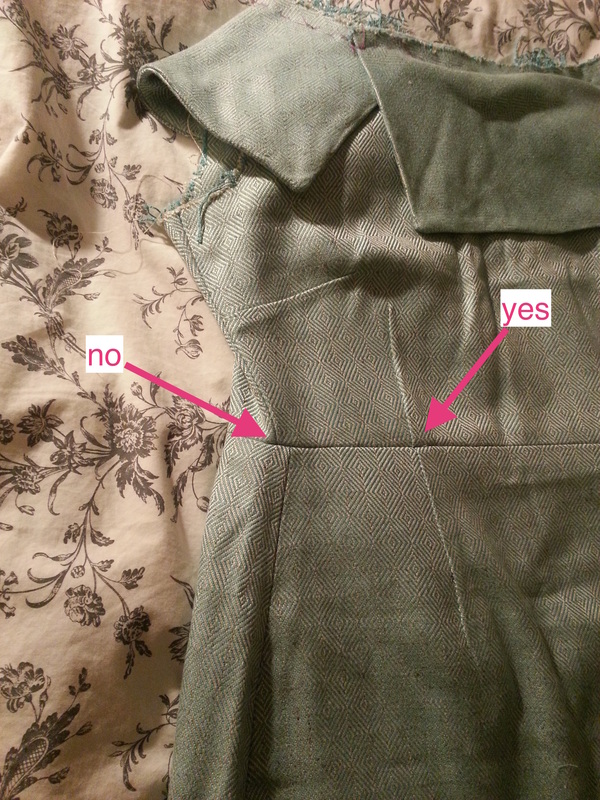 My favorite place to exist is right between these two columns, like the side seam of a dress. That’s where the action happens for me…where I take “what just is” and make something new. 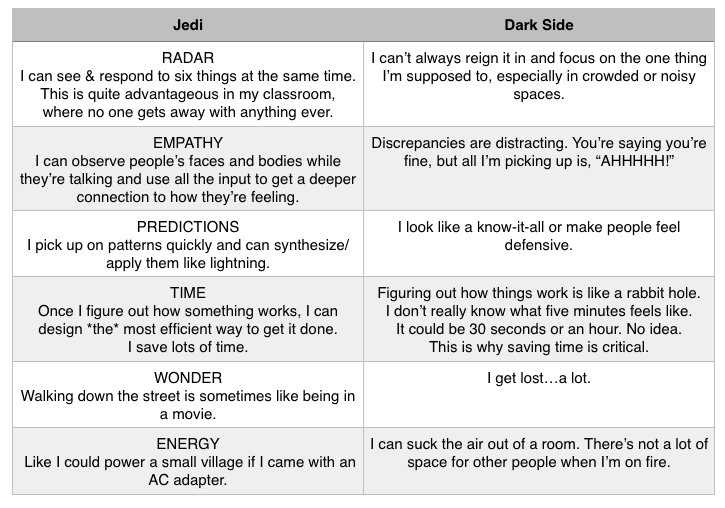 For example, I can sometimes use my Predictions Jedi and influence the Dark Side of Radar. If I know I’m going to a train station, I bring headphones or earplugs so I can focus on where the train is and what time it leaves. If I’m meeting someone for dinner, I ask to sit facing away from the action so I can focus on them. If I’m going to a popular museum, I get up at the crack of dawn so I can be all by myself and actually focus on what I’m there to see. (I slayed Paris in August, no small feat.) When I’m in a meeting, I write down what I notice and wait until everyone else catches up. But guess what? One error does not a dress make. It will eventually look fantastic on me because I made it, with my own two hands. And I wouldn’t trade that for anything.